Monte Carlo and Caboodle #Giveaway (2011 Holiday Gift Guide) CLOSED!! I remember when I was in Junior High, I had to have my Caboodle. It was something I wanted for my eleventh birthday, commemorating my step up from Elementary to Junior High. Then as I went on to High School, my Caboodles were must have necessities! I used them for my makeup, hair accessories, and basic jewelry. If I was going to be away for the night, I had to have one of my Caboodles stocked up with my basics that I had to have with me in order to be presentable, lol! 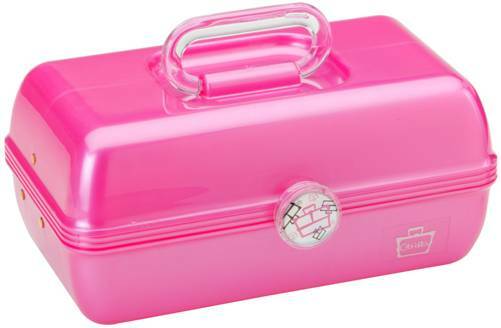 I know that the majority of my friends had their Caboodles as well and they felt the same about them. I still have my makeup cases, my jewelry boxes, and my accessory case, but nothing will ever compare to the Caboodles I had growing up!! So when I was asked to do a giveaway for my readers on a great pack that included the new movie Monte Carlo and a Caboodle, I had to ask if I could get my own Caboodle as well! I was so excited when it came in. It brought back so many memories!! They still look the same inside and out, which I find to be classic! Now I did get a chance to watch the new movie Monte Carlo and I loved it. It is about a group of girls who are related by marriage. Two of them are also best friends while the oldest of the girls, has her life already planned out and set. She finds her sister and step sister to be very juvenile in their behavior and the way they live their lives. Well for the youngest girls graduation present the girls are given the chance to explore some of Europe! The trip was written out to be a very planned trip, but they soon find out that things dont always go as planned. The girls went with a tour group so they could see the sights of Paris, to find themselves left behind. This may have seemed to be a tragedy, but turned into an adventure that will change all of their lives forever!! They get a chance to go from a ordinary middle class lifestyle to a very high class, royal lifestyle! The girls take advantage of this once in a lifetime opportunity and live it up to the fullest!! I love this movie and the Caboodle is a perfect addition to make for a great prize pack to give to any young lady this holiday season!!! Tell me who you will be winning this awesome prize pack for!! Please leave me your email with this entry!! This giveaway is open to US residents. This giveaway will end at 11:59 pm on November 12,2011. Winner will be chosen at random.org and will be given 48 hours before another winner will be chosen. All products for reviews and giveaways are given as a sample from the companies. All opinions in reviews I conduct are my own. I was not paid to say anything or review any products. Next Post Girls Night In #Giveaway Dove Chocolate Discoveries (2011 Holiday Gift Guide) CLOSED! Sherri J. savvyblog@yahoo.com I am entering this to win for my daughter who is 13 and loves Selena Gomez and containers for her makeup and nail polish. I would like to win this for my daughter who has tons of jewelry and makeup and hair accessories to put it to good use. Google +1 the post – entry 1Sherri G.
Google +1 the post – entry 2Sherri G.
Google +1 the post – entry 3Sherri G.
I'm winning this for my baby sister! 1 fan on fb Lisa W.
2 FAN ON FB Lisa W.
NETWORKED BLOGS : Lisa W.